CONICET researchers managed to reutilize the residue of winemaking in other industries. 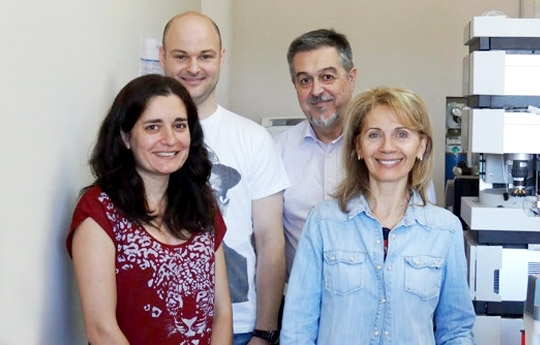 Rubén Bottini, CONICET researcher, together with his team. Photo: courtesy researchers. “Producing wine is an art based on a knowledge that has been developed through tradition, but could be nourished by science”, Rubén Bottini, CONICET principal researcher of the Instituto de Biología Agrícola de Mendoza (IBAM, CONICET-UNCU), says. Alongside with his team, he undertakes a project to reuse the residue of winemaking. Since 2009, the IBAM works together with the Catena Zapata winery of Mendoza to generate knowledge that improves the position of wine in the market through scientific and technological research conducted by both parts. For ten years the research has been focused on determining the association between the local environmental conditions and the response of vines in terms of the quality of red wine, especially Malbec in high altitude vineyards due to the high incidence of ultra-violet radiation and the effects of temperature. The team is currently making a study in collaboration with the Faculty of Medical Sciences of the National University of Cuyo to investigate the winemaking residue called marc, which is usually used to recover alcohol or tartaric acid. The marc is the solid residue of grapes after pressing to obtain wine, and its characteristics are closely related to the factors under which the grapes are produced. During the winemaking process different residues are extracted. In the case of the marc, bioactive compounds such as polyphenolds and terpenes, which have antioxidant properties, are obtained during the extraction process. These molecules are used in cosmetology, pharmaceutical industry, fungal diseases control of vine and food preservation. Together with other medicine colleagues, Bottini and his team are comparing the individual chemicals to the raw pomace. They study their impact on lab animals suffering from diabetes or circulatory problems, with promising results. “This provides a new perspective on biotechnological applications of residues. These studies are not only limited to health issues, but can be used to produce functional food”, Bottini comments. “The most interesting part is that we are conducting this study with a private counterpart, something difficult to combine”, the researcher concludes.